Sometimes, when I'm in a bind — I can't find my makeup bag, my face looks puffy after a particularly hard Wine Wednesday, or my greasy hair is only getting greasier with dry shampoo — I ask myself, WWGPD? That is, what would Gwyneth Paltrow do? It's not that I'm a superfan, or want to be as Goop-y as the queen bee of goop, I just know that she'd have an answer. For example, according to Paltrow, jade rolling cures a hangover face, which is the kind of advice you get from reading her site. But hair that's perpetually flat and greasy? I've heard the one about a low ponytail — which is definitely the kind of chic, effortless style you'd expect from the Oscar winner — and been less than impressed. But now, I realize Gwen and Goop have an even better handle on summer's greasy hair rigamarole. How to revive and soften dull, flat, oily hair per Gwyneth Paltrow? Sprinkle your scalp with magical pink sea salt, sourced from the highest mountain of the Himalayas, of course. I started using Goop's new G.Tox Himalayan salt scrub shampoo and my hair has never felt cleaner, softer, and fuller. The secret is in the exfoliating blend of mineral-rich Himalayan pink salt, nourishing cold-pressed moringa oil, and pure unfiltered rose hip oil, all of which work in tandem to deep clean the scalp of all dirt, oil, and fullness-plaguing dry shampoo buildup. Basically, I scoop my fingers into the pink-tinged, thick, whipped mousse, which feels a lot like digging into a tub of creamy Land O' Lakes butter, and slather the stuff all over my wet scalp. Then, I gently massage my head, feeling the fine-grain salt crystals sloughing away the weighty grime in my roots, which somehow accumulated in day-two hair — but hey, that's sweaty summer for you. Unlike other traditional sulfate-free shampoos, the cream scrub satisfyingly lathers, melding into a frothy, luscious foam that smells like the most complex, sophisticated citrus mixture, made up of orange, rosemary, and peppermint — heavy on the orange and rosemary, with a barely-detectable touch of minty freshness — which is both soothing and invigorating at the same time. I follow up with a small dollop of John Freida Sheer Blonde highlighting conditioner focused through my ends (I'm told it'll help activate my highlights, but I can't really tell if it's working to be honest, but it certainly makes my hair feel nice). I rinse it all out, stepping out of the shower with truly nourished hair that dries soft and shiny, with fresh and full volume at the roots. Lesson number 3,245 I've learned from Gwyneth Paltrow: A clean scalp is the key to healthy hair. Someone hold me back, because I may just start touting the health benefits of probiotics and scheduling a leech facial — that's how Goop-y I'm feeling right now. 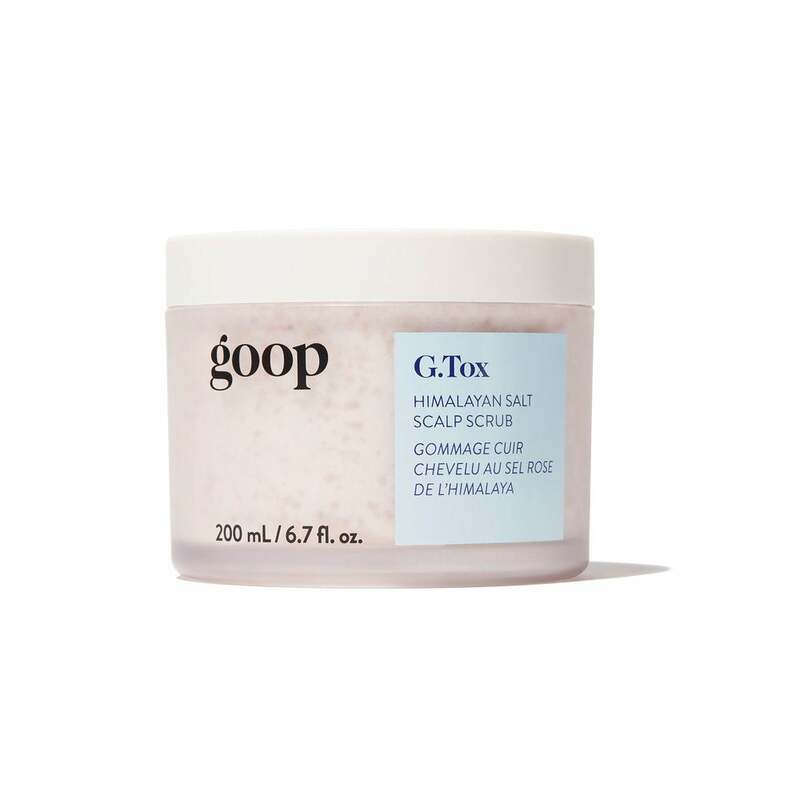 Goop G.Tox Himalayan Salt Scrub Shampoo, $42, available at Goop.